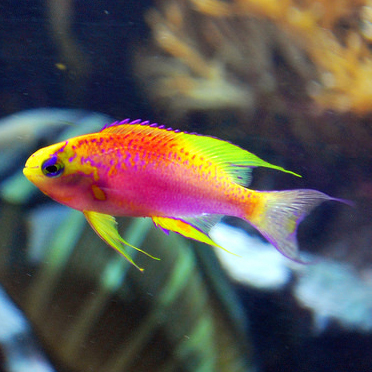 The Ventralis Anthias is a stunning and sought after reef fish. Sadly, it is a delicate, difficult species to keep in captivity. They need to eat almost constantly and require 3 or more feedings a day of meaty plankton foods like enriched live adult Artemia, copepods, msysis shrimp, etc. They are very shy and can be easily intimidated by tank mates. They should be slowly acclimated to both new aquarium water parameters and aquarium lighting. Bright lighting and stress can easily, quickly kill this species. A single male may be kept in a 75 gallon aquarium. If you wish to keep a school of Ventralis Anthias, keep one male with about 10 or more females in a very large aquarium to prevent individuals from being singled out and killed. Do not keep more than one male in an aquarium.